Sir Alex Ferguson has taken aim at those who claim he left behind an ageing squad at Old Trafford by insisting that it was an “insult” to suggest he left the club in anything other than rude health. The former Manchester United manager also bemoaned Louis van Gaal’s bad luck with injuries that had left the Dutchman taking “one step forward and two steps back” and the side “fragile at the back”. But he said he had “no doubt” that Van Gaal was the right man for the job and had “the stubbornness and the determination” to put things right. 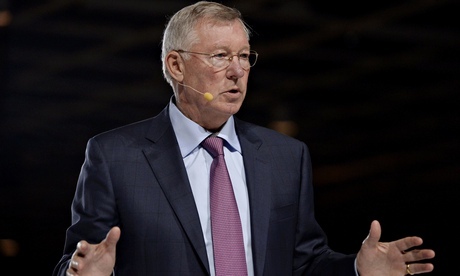 At an event at London’s Theatre Royal to promote the release of the updated paperback version of his autobiography, Ferguson said he left behind the core of a successful squad when he handed the reins to David Moyes at the end of the 2012-13 season. Ferguson said that he left behind a nucleus of young players including David de Gea, Rafael and Fábio da Silva, Phil Jones, Chris Smalling, Jonny Evans and Danny Welbeck. “Then there were the older players; you’re talking about guys like Van Persie, Carrick, Evra, Vidic,” said Ferguson, who was lightly grilled by the actor and lifelong Manchester United fan James Nesbitt over 90 minutes. “The early 30s today are your peak, the way they are training today, the modern pitches,” he added, referring to the fact that both goals in United’s draw with Chelsea at Old Trafford on Sunday were scored by strikers in their thirties. He said the charge that he had left behind an ageing squad was “an easy one to defend because the facts are all there”. Exploring the extra chapters that he added to his autobiography, covering the troubled 10-month tenure of Moyes and the subsequent appointment of Van Gaal, he maintained that the former Everton manager had made a mistake in not retaining the services of his assistant Mike Phelan. But he predicted that Moyes would go on to have a successful career and would be stronger for his ill-starred experience at Old Trafford. “He’s a decent manager, a hard working guy, he’ll do well. There’s a lot of managers who have faced adversity and done well,” said Ferguson, citing Carlo Ancelotti’s post-Chelsea haul of trophies and Ron Atkinson’s experience at Sheffield Wednesday and Aston Villa after leaving Manchester United. Ferguson also attempted to give an insight into what had made him the most successful manager in United’s history with 13 league titles, pointing out that on the six occasions his side had finished second in the league they had gone on to reclaim the title the following season. Ferguson admitted selling Jaap Stam was a “mistake”, said his best signing over his 27 years was not Ryan Giggs or Cristiano Ronaldo but the Carrington training complex and that the worst present he ever bought his wife Cathy was a pair of moon boots. He listed the qualities of each of the “Class of 92” in great detail, saying that they gave United a DNA for success. But over 90 minutes, the only passing mention of his former captain Roy Keane – who has been liberally distributing his views on Ferguson as part of his own book tour – was to bemoan a goal that he once had disallowed. As with most things during his career, this was an event conducted entirely on Ferguson’s own terms.